Perú is one of the few countries that produce high quality fruits due to the special climate conditions. We supply our fruits from the areas of north of Perú from the city of Casma to Piura. The farm and producers we are collaborating with are in complying with the international rules and regulations. KENT MANGO The fruit is a regular oval shape, large 500-700g, with plump cheeks, greenish-yellow color with red shoulder. Very rich and sweet with fiber-free flesh like butter when ripe. A softer mango that really should not be put to the squeeze test. Season Starts from week 48. TOMMY ATKINS MANGO Developed in Florida in the early 1920's. Mango cultivar developed and grown for commercial export. 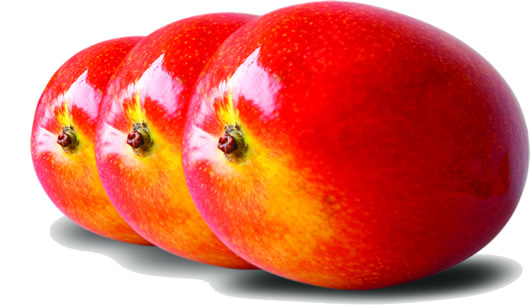 The fruit is a regular oval, medium to large sized, 300 to 650 g, yellowish-orange with deep red to purple blush, thicker skinned, juicy but firm with medium fiber. Susceptibility to anthracnose is low as compared with the other exportable varieties. Season Starts from week 47. 1. For the manufacture of mango juice. 2. For the preparation of fruit salads. 3. Dried and consumed in the dry form. 6. Local variety exported green to UK and used as pickle. 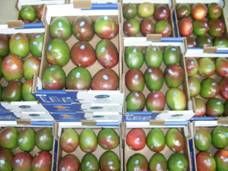 The mango fruits from Peru are graded and packaged in 4kg cartons. We use special packaging made to protect the produce properly. The materials used inside the package are be new, clean and of a quality such as to avoid causing any external or internal damage to the produce. Size is determined by the weight of the fruit. Mangoes are sized according to the following weights.